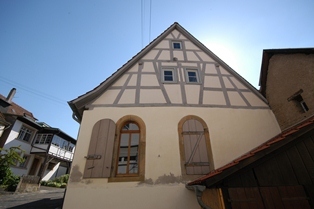 Jewish and Christian inhabitants of the village Odenbach had lived peaceably beside each other for more than three hundred years. In 1752 a prosperous Jew, Salomon Meyer, built a synagogue for the Jewish municipality which was equipped with splendid baroque paintings inside. Since its founding the synagogue served the Jewish population for services and events until November 9th, 1938. During Kristallnacht the synagogue was not burnt off due to narrow building density, the inner area of the synagogue was destroyed though. 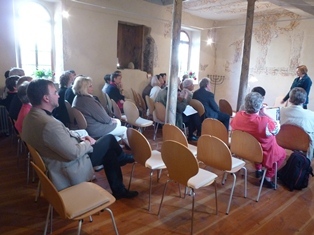 During the 1980’s experts rediscovered this typical village synagogue with its art-historical value of this typical village synagogue. Since the building was no more in use for more than 50 years it appeared to be in a bad state. On initiative of the Protestant parish a non-profit organisation – the “Förderverein” was founded. At first the main emphasis was to secure and preserve the synagogue building as well as the restoration of the valuable paintings.